"Chilling Adventures of Sabrina" is back on April 5. Everyone’s favorite witch is back. The teaser trailer for season 2 of the "Chilling Adventures of Sabrina" is here and a much darker Sabrina is on the prowl. We got a taste of this new Sabrina in the "Chilling Adventures" Yuletide special, and again in the trailer, which shows a Sabrina Spellman (Kiernan Shipka) that hasn't just embraced her powers but looks to be embracing her dark side without much concern. As she says, "It's like I've been walking down a darker path, but maybe that's not so bad." If you're wondering what happened to the innocent Sabrina from season 1, well, she’s definitely not here. The trailer teases murder – and a deliberately-set fire at Baxter High? And the love triangle between Sabrina and Harvey Kinkle (Ross Lynch) and Nick Scratch (Gavin Leatherwood) seems to be in full effect this season. Hmm, guess we'll find out. 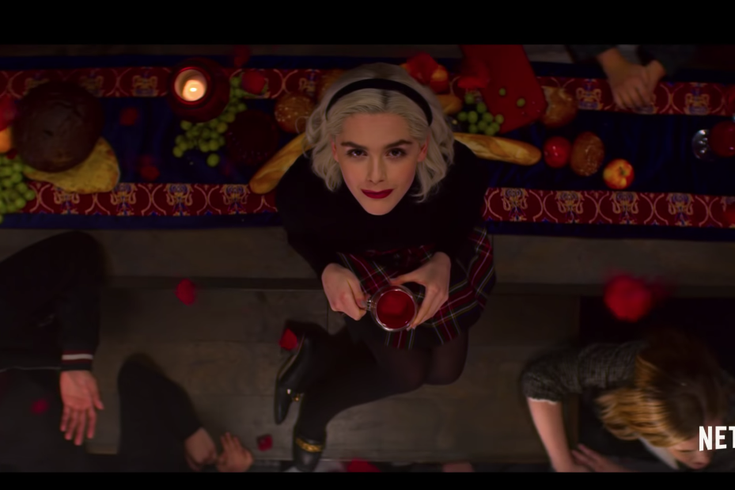 Season 2 of the "Chilling Adventures of Sabrina" hits Netflix on April 5, witches.